Science camps which could change the world! Do the sky and the stars fascinate you? Have you always wanted to observe the moon, the sun, and other marvels of the night sky? Are you passionate about astronomy and do you wish to understand the marvels of the universe? If you answered yes to any or all of these questions, then come join us under a clear sky in the mountains at the astronomical observatory in Saint-Luc and spend the nights observing, photographing, and contributing to a better understanding of our galaxy. During your stay you will learn to recognize different types of stars, observe its luminosity, and make the necessary calculations that will allow you to see the changes in the star’s brightness from a span of a few hours to over a few days. You will also discover how to use astronomy equipment such as telescopes, eyeglasses, and cameras. These tools will be useful for making observations but also for collecting data. During the camp, you will be able to observe, photograph, and analyze all the phases of a star’s life, from the nebula that will signal the birth of a star to the nebula that will announce the star’s death. 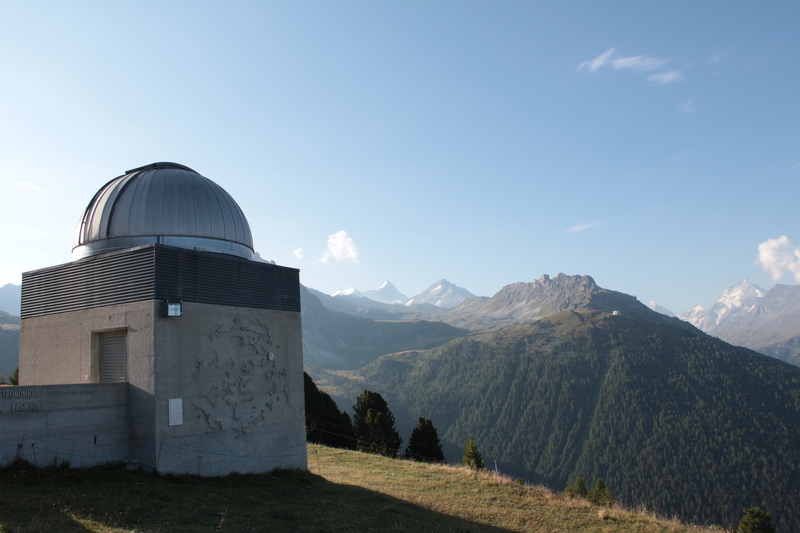 We will spend several nights at the François Xavier Bagnoud Observatory situated in the heights of Saint-Luc. This observatory is equipped with professional telescopes and will act as our operational base. Our galaxy, the Milky Way, contains more than 200 billion stars. These stars vary in size, with some reaching only a few per cent of the mass of the sun while others are of a monstrous size and can surpass several times the weight of our star. The fate of each star is connected to its mass and the consequences of its death could be terrible. All that we are able to observe in the universe is connected to the life of the stars. The earth, the moon, and even the atoms that make up living things had at one time been produced by a star. We are technically made of stardust. However, the stars can also pose a danger. A massive eruption of the sun or an explosion of a star in our neighboring solar system could send man back to the Stone Age, or worse. It is, therefore, essential to learn the behavior of the stars in order to better anticipate the potential danger they pose to man. Some stars, called variables, see their luminosity change over time. This variability in brightness has different origins such as double systems, stellar pulsations, or catastrophic variables which can affect the chances of the star exploding. On the other hand, the luminosity for certain variable stars can be very subtle due to the passing of one planet in front of another. The reasons explaining these variations in luminosity are still relatively unknown, which is why astrophysicists need to make observations to better describe the changes produced within the star and thus understand the mechanics in play. The research goal of the trip will be to study variable stars, the behavior of some of which can be unpredictable, in order to detect potential massive eruptions (eruptive variables, nova, and supernova). For camps taking place during the full moon period, the star of the camp will be the sun. We will follow the solar eruptions, and count and study the evolution of the solar winds during the day. At night, we will discover and perfect our skills in taking images of the moon and its countless craters, without forgetting to observe the sky as well. Research activities will take place at night. You will be allowed to stay up until midnight or even later! The day after the observations will be followed by a late sleep in, allowing you to recharge your batteries in order to be available for the following night. Late morning will consist of preparing for the nocturnal observations, which will include seeing if the weather will be fine, choosing subjects for observation, and organizing what to observe first from the map of stars. In the afternoon we will do a science Science La science est désormais l’affaire de tous. Découvrez la science d’une manière ludique et active. Nous vous proposons d’en découvrir plus sur nos expéditions à la voile, découverte du plancton. activity and the observations will be performed at nightfall. Scientific Program Be a scientific researcher. Participate in concrete science programs. All this is possible with our nature courses on whales and dolphins in the Azores. “Univers” of Objectif Sciences International, specializing in astronomy. As an astrophysicist, he conducted his first research on the mysterious black matter in galaxies, at the Marseille Observatory, before doing his thesis on variable stars, at the Geneva Observatory. He has many years of experience in astronomy and astrophysics. As an observer, he has practised astronomy using a wide variety of instruments, from small, amateur telescopes to professional instruments in the Chilean desert. Corinne Charbonnel is an Associate Professor at the Geneva Observatory. She is a specialist internationally recognized for her research on the structure, formation and evolution of low- and intermediate-mass stars; her research on stellar and primordial nucleosynthesis; as well as her research on the chemical evolution of star clusters and galaxies.